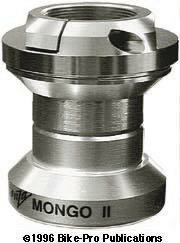 The Mongo II is made primarily of aluminum parts, incorporates added seals against outside contamination and a clamping mechanism on the headlock/upper cone race. The headlock nut also incorporates the upper cup cone race is machined of aluminum, with threads cut for the steerer tube. The top of the headlock is milled, delivering square edges for the headset wrench to grip firmly, but delicately. The clamping mechanism is performed by a cut running horizontally through the un-milled top of the head lock into the threads. A downward cut through the area through this area of this area makes a still-connected arm that comes in contact with the fork threads. This permits a small allen head bolt to screw through and draw the headlock nut tight on the steerer tube, securing the entire headset firmly. The lower side of the headlock has an aluminum race that rests over and seals the bearing cup, (which in this headset's case, is pressed into the head tube). The upper cup race is made from machined aluminum rod that's polished and machined to perfect the edges and surfaces. A groove is cut around it's upper lip with a stiff, porous, plastic seal inserted in it, giving added protection from dirt. The lower cup is also polished machined aluminum. The lower race is forged of aluminum. It's outer edge has a groove around the bottom of it for the plastic seal the upper bearings have. The Mongo II uses two stainless steel bearing races that slope from the center, down toward the outer edge, creating a beveled steel race that gives the roller bearing a full contact surface. These steel pieces lie on the aluminum "race" and in the cup, with a plastic retainer that holds 20 roller bearings which are 4mm long and 2.5mm in diameter, giving a long contact surface. This technique is used for both the upper and lower bearing assemblies. The Onza Mongo II is one of the items that Onza has made in the USA and comes in Silver or Black in 1", 1 1/8" or 1 1/4" sizes. The Mongo II weighs 126 grams in the 1 1/4" diameter.